Who would have guessed that two iconic personalities, both masters in their field, would also face mundane troubles such as missing out on their favourite TV channels? In an interesting interplay between a celebrated personality and a cable operator, filmmaker Anurag Kashyap and percussion maestro Sivamani are seen engaged in a banter in Zee's latest advertisement #WhereIsMyChannel. 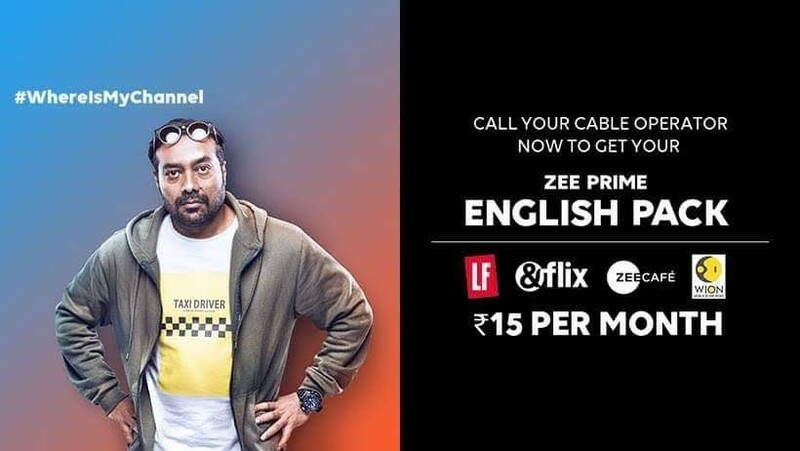 This new campaign by Zee features the two stars in independent ad films as they ask their cable operators for their favourite channels – Zee Café and &flix. With the power to choose the preferred channels resting in the hands of the viewers, people today have an option of choosing only the channels that they watch. However, consumers largely entrust this responsibility with their service providers which is where an interesting conflict arises. To address this predicament and persuade the viewers to ask for their favourite channels, the campaign #WhereIsMyChannel showcases a similar conflict in the lives of Anurag Kashyap and Sivamani. Bringing some of the choicest films, dramas, news and lifestyle content for the Indian viewers, Zee Premium Cluster is the destination for carefully curated collection of entertaining international content. With a powerful bouquet - Zee Prime English Pack - comprising &flix, Zee Cafe, LF and Wion, priced at an attractive Rs. 15/- per month, viewers are truly spoilt for choice when it comes to compelling TV series and the biggest Hollywood hits, alongside international news, food and lifestyle content. For those who appreciate content that is compelling, &PrivéHD brings riveting and award-winning films that stimulate the minds as they enthral audiences. 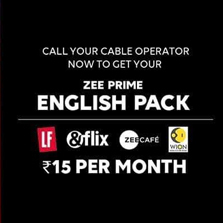 Bringing this world of nuanced cinema, Zee Prime English HD Pack comprising - &Privé HD, Zee Café HD, &flix HD, LF HD is priced at Rs 25/- making premium content more accessible. With #WhereIsMyChannel campaign, Zee English Cluster attempts to throw light on the need to inform the cable operators for your content choices. The first TVC shows Anurag in his residential society where he inadvertently bumps into his cable operator. Anurag is seen rather disheartened as he has been missing some of the biggest Hollywood hits on his favourite movie channel - &flix. Puzzled, the cable operator is caught completely unaware of Anurag's content tastes, since he sees Anurag as a Hindi filmmaker. The film breaks into the broadcaster driving home the message - 'your cable operator may not really know you.' So, inform him of your channel of choice. The film with Sivamani revolves around a similar encounter with his cable operator as he is unable to view the latest episodes of American Idol on Zee Café. With these insightful moments, the ad campaign familiarizes viewers with the need to actively choose and inform their operators. Commenting on the campaign, Anurag Kashyap said, "As a filmmaker, I have mostly been behind the camera and it's always a fun experience to sometimes switch sides and be in front of the camera. Television has traditionally been the primary source of all our entertainment needs, but does anyone ever think about the cable operator? Only when you make plans, but something goes wrong with the cable connection does one think of the cable operator. It was refreshing to shoot the ad film and portray this relationship with the local cable guy. This film brings out that emotion in a fun, engaging way." On being asked about the TVC, Sivamani said, "I am always looking for new inspiration which I believe can come from anywhere. While growing up, there weren't many options to catch international content on TV, but now, the choices are many. As a musician, I do love to watch the incredible talent on American Idol, not many know that I also love to watch sitcoms and international shows like The Big Bang Theory on Zee Café. I often get acknowledged for my unique sense of style, so I don't blame the cable operator in this film, where he mistook me to be a fashion icon. I have informed my cable operator about my channel choices and I encourage others to do so, too." Call your DTH/Cable Operator today and ask for the ZEE Premium Pack!